Last week, Senator Bradley filed a bill to purchase 60,000 acres of land in the Everglades Agricultural Area to construct a dynamic reservoir to alleviate discharges to the Caloosahatchee and St. Lucie Rivers, and provide desperately needed water supply to Florida Bay. This essential component of the Comprehensive Everglades Restoration Project (CERP) has been talked about, and postponed for most of my life, while our estuaries have steadily declined, creeping closer and closer to their tipping point. The current approach to Everglades restoration by our water managers is not working. CERP was passed 17 years ago, and the estuaries of South Florida are continuing to decline rapidly. I would argue that they’re declining faster now than they were 17 years ago when CERP was passed. Up until this point, the focus of Everglades restoration has been on ancillary projects that do not address the root of the problem- the River of Grass has been dammed and diverted by way of manmade canals to the Caloosahatchee and St. Lucie Rivers. Until we address the root of the problem, our community and economy will continue to suffer. This approach reminds me of the saying “The surgery was a success, but the patient died.” That’s what I see happening with our estuaries and the Everglades. I’ve seen so many presentations on the success of Everglades restoration, but just last year Florida Bay experienced a 50,000-acre seagrass die-off due to lack of freshwater flow, the St. Lucie was covered in toxic green algae, and the Caloosahatchee was bombed by high volume, unnatural discharges. Our “patient” is having a heart attack, and our team of doctors are treating the patient for arthritis. 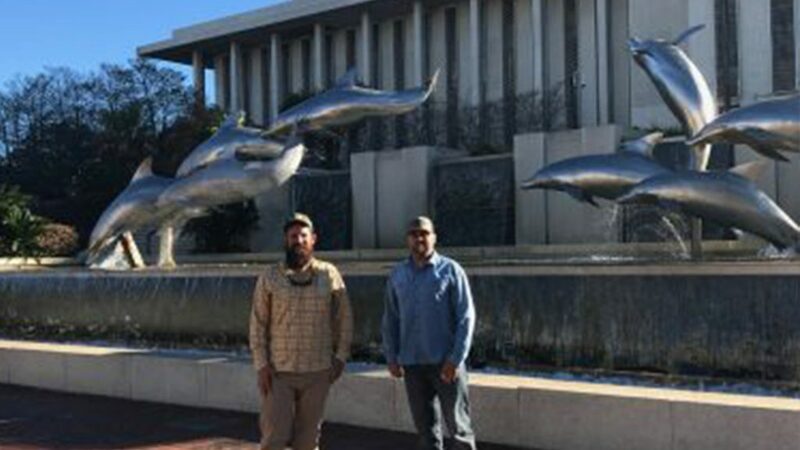 I made my first trip to Tallahassee one year ago with my good friend, and co-founder of Captains for Clean Water, Capt. Chris Wittman. After meeting with scientists at FGCU and Bonefish & Tarpon Trust, we were prepared to sit down with our policymakers to help them understand our concerns. When we parked our trucks and headed toward the Capitol building, Chris looked at me and said: “You know there’s a serious problem when we’re wearing suits in Tallahassee.” We didn’t know what we were getting ourselves into- that we would end up dedicating so much of our time to this. But we promised each other and promised all of the guides, businesses, and families in South Florida that we were going to get this problem fixed. We weren’t going to give up- no matter what. This is a contentious issue in Tallahassee. There are powerful interests that benefit from the current water management system. We weren’t intimidated by the swarms of lobbyists racing through the hallways of the Capitol. They are getting paid to fight for something that doesn’t directly affect their lives, but we are fighting for something we love. The corporate sugar industry has hired 64 lobbyists to oppose this project that is vital to saving Florida’s estuaries. We don’t have the money to hire any lobbyists, but we do have the passion, goodwill, and the power of the people needed to make this essential project happen. While projects can look appealing on paper, in presentations, and from a helicopter, I always ask “What percent better will this make our estuary?” The timer is ticking for our estuaries, and the price of land and construction will only go up. I’m all for completing existing projects, but Component G of CERP (SB10), which would alleviate Lake Okeechobee discharges by up to 50%, is essential, and without it, the estuaries and economies they support will continue to wither away.